This Course provides information about how assistive technology can assist in making telephones and cell phones accessible. 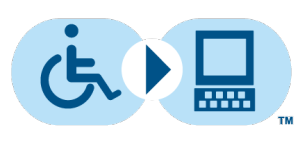 A free public service for communication between standard (voice) users and persons who are deaf, hard of hearing, deaf-blind, and speech disabled using text telephones (TTYs) or PCs via the internet. Many dynamic AAC Devices can work with infrared capable, blue-tooth compatible cell phones, or voice-activated phones. Contact AAC vendors directly to determine which equipment would be most effective. Most medical insurances will not cover the cost of the telephone or accessories due to it not being medically necessary. For some individuals with disabilities affecting their ability to verbally communicate, text messaging is a great option.Warning–Most cities do not have a way to text 911 call centers for emergencies.